Sara and I have a long-documented complicated relationship with Bath & Body Works. I don’t know exactly how her addiction works, but mine goes like this: Bath & Body Works has a sale, I go in there for hand soaps, I come out with twice as many hand soaps as I went in for, plus candles, body wash, and lotion. And I never end up using the lotion. I then experience some self-loathing because I can’t possibly use all the soaps/lotions/candles while they’re in season and I also get mad because I’ll fall in love with a scent only to see it discontinued a few months later. Yes, I do realize that so far, this post is rife with first-world problems (throw in the fact that I cried today because my dog chewed up my daughter’s Rapunzel doll and I’m pretty pitiful…although I am running on a cocktail of zero sleep, Diet Coke, and post-partum hormones, which may explain a few things). One of my favorite scents last summer was Peach Punch. But, because of my soap addiction, I didn’t actually use the soap until the fall/winter, so at that point, peaches were (sadly) out of season and it felt wrong and weird to try and make peach punch in January. So I patiently waited until the big, fat, juicy peaches started making their appearance this summer and I started experimenting. I also ate obscene amounts of peaches. With milk and sugar. I will not apologize for it. For the slushy part of the punch, you’ll need about 1 1/2 pounds of peeled peaches (check out our tutorial on how to save your fingers and peel peaches easily here), sugar, water, peach Jell-O (don’t judge…), lime juice, and orange juice. Combine the sugar, water, and peach Jell-O in a large saucepan and boil for 3 minutes. 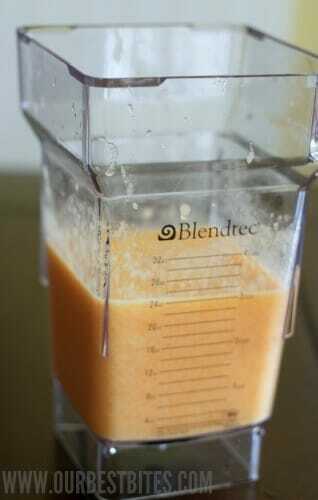 and blend until smooth. You’ll want 3 cups of peach puree. 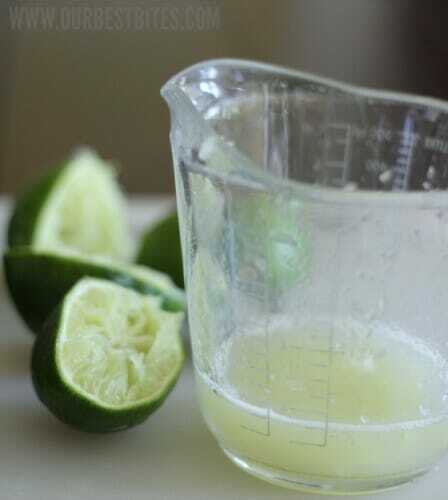 Juice several limes to get 1/3 cup lime juice. Stir in the peach puree, lime juice, and orange juice. Place in a large Ziploc bag (or a couple of quart-sized Ziploc bags–that’ll be easier to use when you’re ready to make the slush) and freeze overnight or for several days. 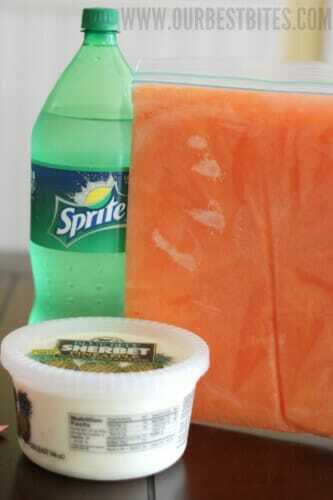 To make the slush, you’ll need the peach mixture, plus 2 cups of pineapple sherbet and a 2-liter bottle of Sprite. 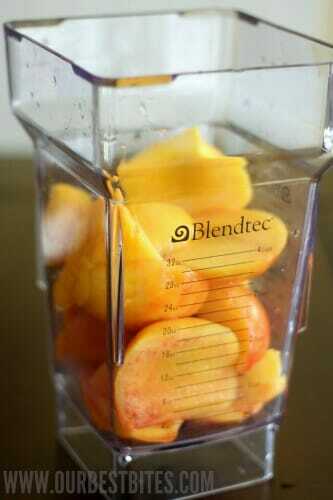 When ready to serve, allow the peach mixture to thaw for 15-20 minutes. Combine the peach mixture with the pineapple sherbet and Sprite in a large punch bowl or drink serving container. Stir to combine everything (it could take a few minutes for things to get good and mixed and slushy). Serve with straws and spoons. 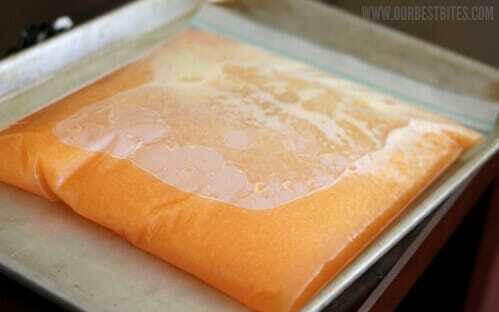 Combine the sugar, water, and peach Jell-O in a large saucepan and boil for 3 minutes. 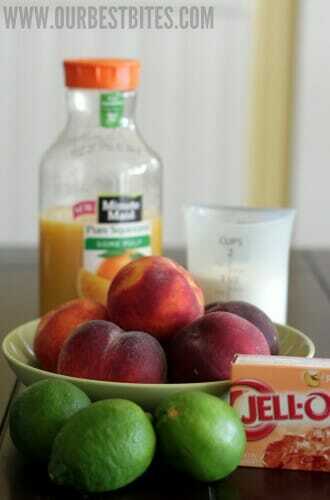 Stir in the peach puree, lime juice, and orange juice. Place in a large Ziploc bag (or a couple of quart-sized Ziploc bags–that’ll be easier to use when you’re ready to make the slush) and freeze overnight or for several days. When ready to serve, allow the peach mixture to thaw for 15-20 minutes. Combine the peach mixture with the pineapple sherbet and Sprite in a large punch bowl or drink serving container. Makes 16-20 servings. You had me at peach. I’m glad you’re not apologizing for eating them plain! Now that’s what I’ll probably do, later today after I run to the store for peaches! Awesome recipe, thanks! Oh yeah! This looks awesome! And don’t feel too bad about the peaches, sugar, and milk–at least you use milk instead of half-and-half like I do! Delicious! And I totally hear you about falling in love with a scent that gets discontinued. I think peach nectar is my favorite, but it’s been gone for a loooong time. 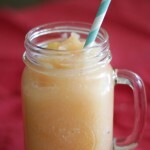 I better make some of this slush to get my peach fix. 🙂 thanks! 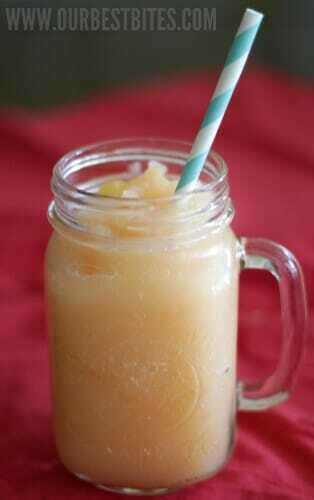 Looks so yummy, and it is a bit of a twist on the standard slush. Bet this would make a great popsicle too… going to pour some into popsicle molds for my little ones! Yum-O!!! This looks so delicious and refreshing. 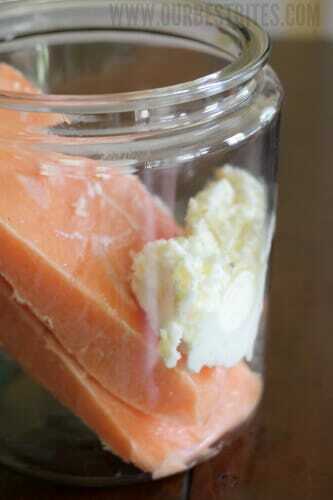 Great idea to freeze and have on hand for when the sludge craving strikes. I can see an adult version of this in the near future! That looks so good! Perfect for Hawaii weather! I just need my blender to get here! This sounds perfect! So refreshing! I was all excited and ready to give this a try until I got to the pineapple sherbet. I haven’t seen pineapple sherbet in my area and wonder if I can use something else. My husbands biggest flaw? He loathes anything peach- taste/smell/texture. . . and I LVOE IT! Maybe I will just make this for ME!! Sounds delish. Thanks again girls!! Ooh, I could make it for the next bridal shower/birthday party I host! PERFECT!! OMG, I have never even thought of peaches with milk and sugar until now and feel i can no longer live without them….I want. I have the *exact* same relationship with Bath and Body Works! How funny! Slush looks good, too. I love love love anything peach! Cant wait to try this! oh yum that sounds so refreshing! Do you absolutely need the jell-o for this? I’m a vegan and it’s hard for me to find gelatin-free Jello. Yummy! I SO want to try this! I read twice, so hopefully I didn’t miss this question; can we used canned peaches, or does it need to be fresh? Thanks, HUGE peach fan!!! You could certainly used canned peaches, but it won’t have that “fresh” peach flavor. Yum! This looks amazing! And now I have a sudden urge to drive to Bath and Body works for peach scented soaps and candles! Love ya! I recently was told about your website by my sister and I have been using your recipes a lot lately! I just found this one and was excited because I canned peaches a few years ago but the peaches I bought were mushy inside! So, needless to say, my family won’t eat them. This recipe is perfect for using up my mushy peaches!! Thanks! I am sure my family will drink these! :) YUM! Haha! We have a Bath and Body Works outlet store near my house. If you think the regular store is tempting, the outlet store gets you good! My weakness is totally the lotion! I keep several bottles around the house to use when I need. Oh and this slushy?!? Perfect for summer! Kind of said I have to wait till next year to make it with fresh peaches, but will probably try with frozen peaches in the meantime. ❮ Previous Post Previous post: It’s Coooommmmiiiing…..!